Air moisture regulating, silicate-based interior fine plaster. Ready-to-use fine plaster to obtain sorption-capable interior surfaces. The risk of fungal attack (fungi/mildew/mould) on the surface is diminished due to buffering of water molecules from inside air and the natural alkalinity of the coating. 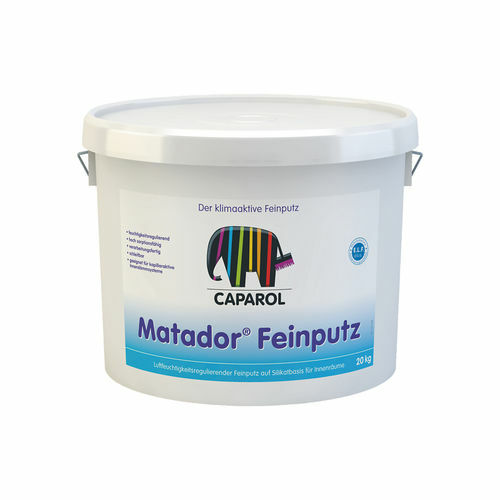 Furthermore, Matador® Feinputz promotes a constant and pleasant room climate. Suitable for use as filling surfacer (spackling compound) to obtain even walls and ceilings in sensitive areas, like preschools, lounges and living quarters. Particularly suitable (efficient) for use in rooms with occasionally higher air moisture/humidity and as fine plaster on capillary active interior thermal insulation composite systems, e.g. Capatect IDS Aktiv and Capatect IDS Mineral. Leads to a smooth surface.